We have had a challenging winter and are hoping for sunnier times ahead. We have continued to offer provision whatever the weather, to our regular SEN groups and have also kept our Wednesday group going..
We were also delighted to host the very first gathering of Forest School practitioners from the South West in November. We have thoroughly enjoyed our literacy project (thanks Ernest Cook Trust) but had to cancel some sessions because of flooding. It made us re-think our shelter arrangements. We don’t have large groups very often but we are planning an open sided larger shelter capable of accomodating a whole school group for those odd times when we do. We have offered two inclusive events for young people with additional needs during the October and February half terms. We have had a successful open day last September. We have had three inclusive volunteer days. We are looking forward to our Spring Celebration on March 23rd which will offer local families the chance to come and play in the woods and enjoy a fabulous puppet show. In the summer term we willbe offering free drop in sessions to villagers thanks to the SCC Health & Well Being Fund. Thank you to everyone who supports us, especially our wonderful volunteers. A wonderful afternoon and evening , we weathered the pissistent rain, made bird feeders and a beautiful earth mandala out of collected materials from the wood. Then we lit candles, ate cake and sang seasonal songs to say thank- you to the beautiful trees and wildlife. We continue to replenish the bird feeders as the birds and squirrels are extremely hungry this year ( I’ve even started to feel sorry for squirrels!) The woodland site at Drayton is suffering from the floods but hopefully it will dry out soon……. 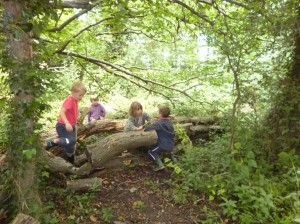 As the summer draws to an end it is time to look back at what has been going on in Drayton Woods over the holidays. The woods themselves have thrived remarkably well in all the wet weather- the young trees have put on lots of growth and the ferns on the northern edge have multiplied. so also have the brambles, nettles and thistles! We have cleared the main paths to allow access, but we are leaving the rest to the butterflys,dragonflys, toads and all the other mini- beasts who are enjoying some warm sun at last . 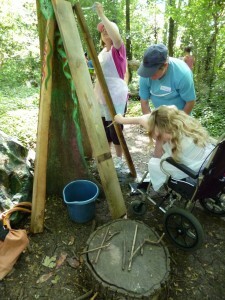 Numerous children have been able to access our wheelchair friendly woodland site this summer, to play, learn and enjoy the wild and natural environment. ‘Get Outside for Inspiration’. March 16th at Hallr Wood. This practical workshop for school staff, forest school leaders and others working in the educational field was attended by 18 people from across the south west region. The start of the day revealed the range and mix of practitioners and their reasons for attending – teaching assistants delivering Forest School, BTCV volunteer co-ordinator wanting to make links with the curriculum, a couple from Arnos Vale cemetery, Bristol getting ideas for outdoor learning, teacher from north Devon looking for more inspiration for his Bushcraft and Country Way woods, teachers from a special school seeing how to use the outdoors for life skills, and teaching staff from a range of schools from Bath to Dorset wanting inspiring ideas for getting outside in their school grounds. The main aims of the day were to get ideas, games, inspiration and confidence to deliver a range of literacy, numeracy and cross curriculum topics outdoors. In the morning sessions the 3 groups, Early Years and KS1, Special Needs, Secondary and outdoor practitioners rotated around activity based workshops set in different parts of the woodland. Jenny Cater (Space 2 Play. Outdoor Learning Environments and FS leader) used ‘nature’s natural numbers’ on wooden cookies to create curving number lines to jump on and use for a range of numeracy skills. Journey sticks were made into 3D shapes and Pythagoras’s theorem of 3, 4, 5 triangles were used to make large scale quadrants. 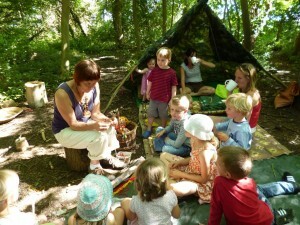 Deb Millar (Outdoor educationalist, archaeologist and FS Leader) enticed the different groups into a world of fantasy with the creation of miniature habitats, getting enthusiastic about fantasy bugs and mapping out the environment using sensory trails. After a welcome lunch of hot soup to warm everyone (thanks Karen!) the afternoon session by Jenny gave a brief introduction to the process of designing and landscaping your own space to get outside and be inspired to learn. Finding out how everyone feels about their environment, zoning different areas (fire/cooking, access points, tool activity, woodlands and wildlife) and deciding on a project they could take back and put into practice were the key elements. By the end of the day, the wind had whistled through the trees and we were getting chilly but there was a buzz of enthusiasm and requests for more learning outside workshops in the woods. Perhaps the greatest inspiration had come from being in the woodland environment with so many like minded people and sharing possibilities and ideas for getting outside and using our natural surroundings to inspire our teaching and learning. Feedback: What Inspired you today?? A great mix of ideas and discussion. Lots of ideas to work and develop. Great atmosphere generated. Thank you. Made me feel that outdoor (FS) learning is fulfilling and has spurred me on! Whole day was inspirational and supportive. Love the space. Great soups. Very helpful grounds talk. Stimulus for literacy I found useful and will definitely organise. Particularly developing a story trail, what happens where…..
What inspired me? Numeracy line and literacy games. Being creative. Something good from natural materials. Fire circle, chatting, sharing. Thank you! Many thanks. Sharing ideas. Camp fire – central point. Freedom within self and the surrounding area. Opening circle – network of like minded people. Great ideas to practically use. We are thrilled to have been awarded funding from the Ernest Cook Trust for a creative arts project to boost literacy in local schools. 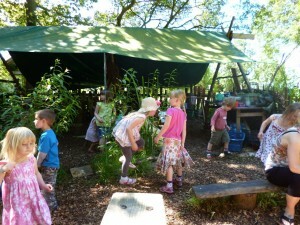 http://www.ernestcooktrust.org.uk/ We will work with secondary aged pupils to design story trails and a performing area. 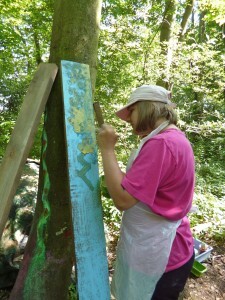 We will then invite local Primary Schools to our woods for creative writing, mark making and to develop traditional tales. THANK YOU Ernest Cook Trust! 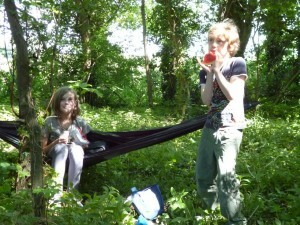 We have been working hard at Hallr Wood this spring. We have planted lots of trees (especially hazel) and we’ve improved our paths, rain water collection and tool storage. 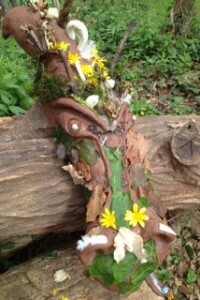 Our beautiful earth dragon is now finished thanks to the Tree Pirates and will shortly be planted up with wild flowers. 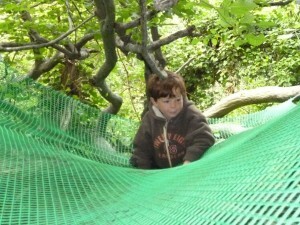 Over Easter we ran a woodland playscheme and also hosted a day with Promise mentors and their mentees. We enjoyed the CSOLP 5 year celebrations which was a lovely informal evening of food and camp fire, spent reflecting on all that has been achieved since we started our group. 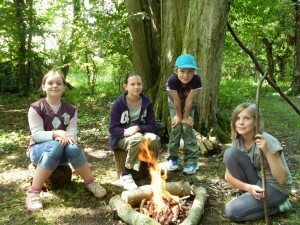 Several other groups also ran holiday activities at Hallr Wood. We look forward to a busy summer, enjoying the benefits of all our hard work! Special thanks to our trusty volunteers who help on Wednesdays. 12 young people with a variety of abilities and additional needs attended Wilderwoods Woodland Adventure day at Drayton Woods on Thursday 16th February. Well supported by Forest school leaders & support carers, the young people spent the whole day in the woods, getting involved in various woodland tasks: making bird feeders, planting trees and helping create a willow screen. 3 young people from Langport came along to buddy up with some of the young people attending. The day started with an opportunity to take part in an animal stamp trail. This was designed to be followed at the individual pace of different participants, including Katy in a wheelchair. Everyone was very proud of the stamps they had collected. Pine cones were ‘found’ and collected on the trail and then filled with a bird food mixture. Some loved the different textures involved, others left the sticky bits to others! The filled pine cones were then taken out into the wood and hung on branches for the woodland birds to find. Meanwhile cooking was getting underway back at the campfire. 17 baked potatoes were buried in the ashes and left to bake as a team set off to plant trees in the wood. The Woodland Trust has kindly donated a mixture of trees that will eventually bear edible fruit: blackthorn, elder, crab apple & wild rose. A wonderful tree planting team planted 10 trees, complete with stakes and protective spirals, while others engaged in clearing ivy away from selected trees. One boy just enjoyed sitting on the woodland floor soaking up the peaceful atmosphere. We were lucky to have a sunny and warmish day! At lunch time young people helped cook and eat: 60 sausages, (plus 6 veggie ones) 15 baked potatoes, a big pan of homemade baked beans and loads toasted bread, all prepared on the campfire. After lunch we were treated to a wonderful story about the beginning of spring, told by our visiting story teller Amanda. All (but the most hyper-active), listened enthralled, including the boys. The older boys were able to go into the wood with the buddies for target practice with only monitoring adult supervision needed. This was a wonderful freedom for both the disabled young people and the buddies involved. mentoring 3 young people, all with varying degrees of Autism. They had to be reminded a few times but they hung on in there, showed care for others and created a brilliant, safe, boys atmosphere. I think those less able really loved it and really felt part of a group. 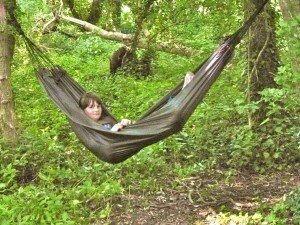 One very hyperactive autistic girl loved just hanging around the boys when they were using tools. I was very impressed by the maturity of the buddies who were able to accommodate this in a safe, non confrontational way. Many thanks to Karen, Amanda, Camilla, Kevin, Fiveways School support carers Jane, Mary, John, Emma, Lauren, Alice, and Langport Buddies Matt, Joe and Keiral, for making this day such a success and enabling the group of young people, who normally spend a lot of their time indoors, to ‘Get out in the woods and go wild’! Also many thanks to the Short Breaks funding team for their continuing support! Regular visitors will have noticed that we have changed the structure of our website recently. Many thanks to Will who looks after the web site for us and puts up with our limited technological understanding. We would all rather be in the woods…and it shows! The events page now shows a list of upcoming events as well as a calendar. Events for both sites can be found here. 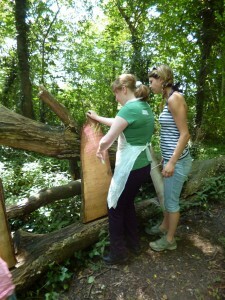 Hallr Wood and Drayton Woods are now separate main pages to make them easier to find. Photo galleries for the two woods are now added to their respective pages. The gallery software has been updated to help show off all of our lovely photos. Ten of us gathered together on one of the frostiest mornings of the year to be initiated into the ancient and traditional craft of basketmaking. Armed with gauntlets and old baked bean tins (?) we set about dethorning vicious bramble stems. The sound of a bramble being forced through a hole in a tin has to be heard to be believed! Once subdued we began to see our garden enemies in a whole new light. No longer were they stealthily attempting to slash our skin to shreds or attach themselves inexorably to our clothing. They underwent a total transformation, becoming instead sturdy green and purple frames and handles for our baskets. Our teachers, Linda and Hannah, dealt patiently with all our queries, soothed us when willow rods snapped and introduced us to the vocabulary of basket making – ‘slyping’, ‘waling’, ‘tips and butts’ ‘upsett’ and ‘randing.’ Once every rib was slyped and in place we were off. We sat around the fire chatting, listening to birdsong (and from time to time the farmer inconsiderately cutting the hedges with something very loud!) 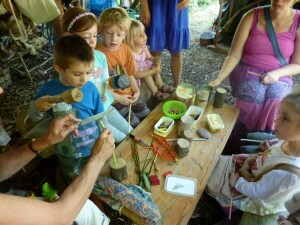 totally absorbed by the rhythm of weaving the willow, ivy or bramble seeing each other’s our creations take shape. Everyone put their individual stamp on their basket design – some enviably neat, others of us going for a rather more rustic and airy look! It is hard to describe how relaxing it was just to simply be outside and thinking about absolutely nothing except getting the weaving right, choosing which willow to use next and seeing our work actually begin to look like baskets. The range of colours was amazing – acid green, deep red, olive green, saffron yellow and purply-green. We could hardly bear to tear ourselves away from our creations when it was time for lunch. By the end of the afternoon we were admiring each other’s handiwork, all of us now the proud owners of our own unique handmade baskets. The sense of achievement from making something yourself from natural materials (which you could actually use!) was truly satisfying. The fact we had spent the day outside was an added bonus. 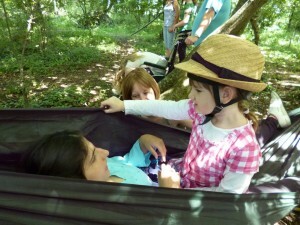 Click on the basket photo in the Drayton Woods Gallery to see all our creations and get a flavour of the day. 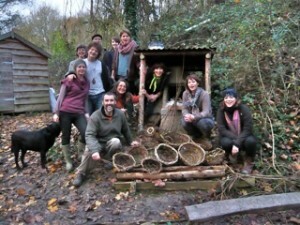 Lynda Shaw and Hannah Aitken ran a wonderful hedgerow basket workshop on 20th November. Do look at the Hallr Wood gallery to see the photos. Some stages of the process were soothing, some utterly frustrating! We all managed to finish our baskets except for Cee who was supposed to be cooking anyway!They will be running willow baskets in January at Drayton.